Barclays Bank is handing out handheld chip-and-pin card readers as part of a new online security initiative. 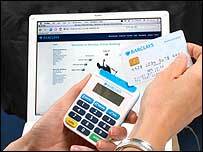 The device, similar to a calculator, will be used to login to the Barclays site to make certain payments. Barclays says the reader will do away with the need for passwords and memorable words, and introduce a new layer of security to online banking. More than half a million customers will be sent the Pinsentry machines by the end of the year, the bank said. "Barclays is constantly working to help protect customers and their money and that is why we have invested in this system," said Barclays' director of electronic banking Barnaby Davis. The gadget will initially be sent to personal and small business customers who use Barclays' online banking service to set up third party payments to someone new. A spokesman for the group said Pinsentry meant there would now be four levels to online security. To access their account a customer would need their debit card, its Pin number, the customer's online security number and the Pinsentry device itself. Once the customer has swiped their card through the device, and entered their Pin number, they will be issued with an eight digit code - which changes each time the information is entered. The resulting code could help fight fraudsters who hack into people's PCs or use "phishing" emails to steal login details. "We believe it is going to be very difficult to break into this system," a spokesman for the bank said. "However, we have always said we will refund money to people if they lose it through no fault of their own." Barclays is not the first bank to introduce such devices. In 2005, Lloyds TSB launched a keyring-sized security device, or "token". This generates a six-digit code - which changes every 30 seconds - to be used alongside usernames and passwords. Online finance service Paypal introduced a similar token earlier this year.